On September 10, 2010, the International Bluegrass Music Museum in Owensboro, Kentucky will observe what would have been the 99th birthday of Bill Monroe (September 13 the actual date of his birth) with a special exhibit that will run for two years and contain relics, music and information about the Father of Bluegrass Music. Going on public display for the first time as part of this exhibit will be Monroe's iconic original headplate from his 1923 Lloyd Loar mandolin, the one he carved out the word "Gibson" with a pocket knife in or around 1951, subsequently repaired by Gibson. Thought to be lost or thrown away during the headstock restoration in 1980, the headplate surfaced for auction at Christie's in December, 2009, and sold to an undisclosed bidder. The owners are Laura Weber Cash and husband John Carter Cash. Yes, that Cash, the daughter-in-law and son of Johnny Cash and June Carter. This icon of bluegrass music—a piece of a simple mandolin—found a home in a family with roots reaching deeply into the history of Country Music. At the age of 17, Laura took first place in the Junior Division at the National Fiddle Championships in Weiser, Idaho. In 2009 she returned 20 years after that win to take first place in the Adult Division. 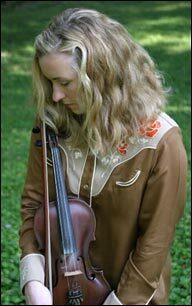 A seasoned fiddle player with a lengthy resume in Nashville, Laura has toured with Patty Loveless, Pam Tillis, James House, Chalee Tennison, Sarah Evans, Brad Paisley, and has recorded two albums in the traditional country style. She has appeared on the Grand Ole Opry with the late Roy Acuff and his "Smoky Mountain Boys," as well as Ray Price and his "Cherokee Cowboys." Ten years ago, she was invited to play fiddle with June Carter-Cash on a tour to promote the album Press On. She has also recorded with Kris Kristofferson, Loretta Lynn, George Jones, Earl Scruggs, Billy Joe Shaver, Mac Wiseman, and many others. Thanks to Bruce Harvie and the Mandolin Archive for the following audio segment of Bill Monroe talking about acquiring his famous mandolin and subsequent relationship with Gibson over the years when the headplate was replaced. Mandolin Cafe: You shared a wonderful story about your childhood in connection to Bill Monroe and his music in preparation for this interview. Laura Weber Cash: As far back as I can remember, Bill Monroe's music was a part of our home. We moved from northern Illinois to Oregon in 1978. My dad, a banjo and guitar player at the time, found the bluegrass music scene to be prominent in the Willamette Valley. When the album Bean Blossom '79 came out, I was at the age where I started taking a more serious interest. As an 8-year-old girl, I began to talk like Bill. My parents found it a bit strange, but amusing. I had memorized every word of his monologue... "Here's a number that we like to feature a lot... Here's a number we'd like to do in memory of Lester Flatt entitled The Little Cabin Home On The Hill." To this day, I can just hear him saying those words. I haven't actually owned a copy of that record in my adult life, but it sure did make its mark in my memory before I ever picked up a fiddle. Mandolin Cafe: As a professional musician living in and around the Nashville, did you have the opportunity to see him perform? 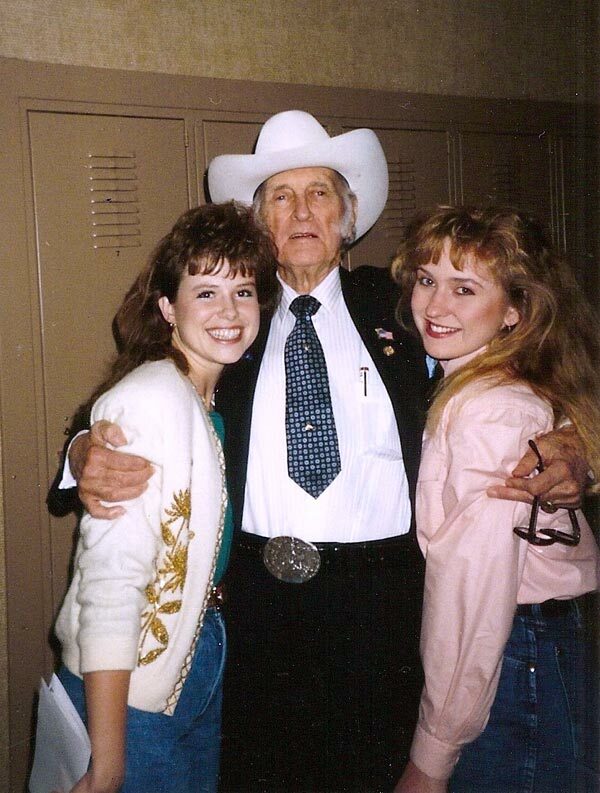 Laura Weber Cash: When I moved to Nashville in 1989, I soon discovered Bill Monroe played every Wednesday night at the Bell Cove Club in Hendersonville. I couldn't believe it! When I wasn't on the road, every Wednesday night, without fail, I was there. One night, I brought Benny Martin out there to see Bill. Another night Jimmy Martin showed up. He asked me to play fiddle for him, and he played everything in A flat and F sharp. He was in some condition, telling jokes. Bill got up and left in the middle of Jimmy's set, and oh, that made Jimmy so mad. There was a family of regulars always there on Wednesday nights. We sure had a great time watching the old man passing out quarters to the kids. He gave one to LeAnne Perkins, Larry Perkins daughter, with a big grin on his face, then looked at me, scowled and said, "Now, you let her keep that," in true Monroe form. I was thrilled and humbled to be on the guest list when he started having picking get-togethers at his farm in his last years. What a sweet time for him. It was quite endearing to witness his transformation. He seemed to soften up quite a bit. Bill Monroe hosted this jam session at his cabin in Goodlettsville, Tennesee. A number of the people in this photo are prominent bluegrass musicians including members of the Del McCoury Band, David Grier, Mike Compton and others. Laura Weber Cash is pictured on the far right with fiddle. Click for enlarged version. Mandolin Cafe: In your decision to purchase the headplate, was there ever a moment where you thought it might be headed out of the country, or was there some other personal reason why you thought it important to acquire? Laura Weber Cash: Yes, I suppose that was part of the reason. It's one of those things that should stay close to home. I imagine it seems somewhat presumptuous, but our deepest intentions are pure and dedicated to historical preservation. We are committed to take the best care possible while it's in our hands. Mandolin Cafe: We can think of several museums in the United States that would jump at the chance to display the headplate. The museum in Owensboro made no secret of the fact they were one of the bidders. Did that play a role in your sharing it with them for this extended display, or was there another connection? Laura Weber Cash: When we were bidding, we had no idea that we were bidding against the museum. We were the final 2 bidding parties. If we had known, we would not have kept going. John Carter and I are very dedicated to music history and it's preservation. I'm captivated by music history. I had actually put in an application in the archives at the Country Music Hall Of Fame long before I ever met John Carter. And, of course, he has the history on both sides: his father being Johnny Cash, as well as the rich musical history from his mother, June's side, the Carter Family. Mandolin Cafe: Did you have an opportunity to inspect the headplate prior to the auction? Laura Weber Cash: I had flown to New York last September and had an opportunity to view the headplate in person at Christie's. When I saw it, my mind couldn't believe it. I had heard the story my whole life of how Bill had been angry with Gibson after taking months to do minor repairs on his mandolin, and gouged out their name from his headstock with his pocketknife. His Lloyd Loar! And left it that way for nearly 30 years! I loved Bill from the moment I heard that story. In my imagination, he was a strong force of a man I would never want to cross. This tale was larger than life, almost seeming like a myth to a young girl. Given that no one had seen his actual handiwork since Gibson repaired the headstock for him in 1980, finally seeing it in person was a huge thrill. I've heard some bluegrassers call it the Holy Grail. 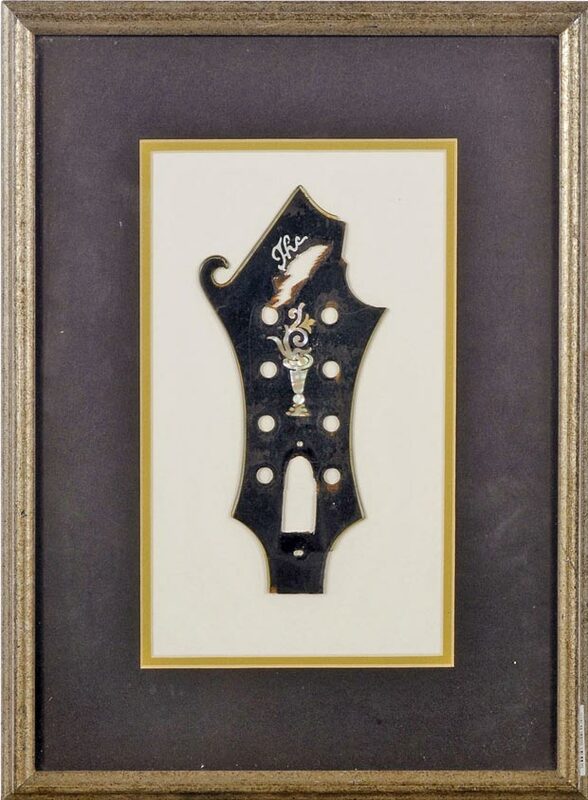 Bill Monroe's mandolin headplate as photographed by Christie's Auction House. There is a high resolution version of the above image here. Mandolin Cafe: Your ownership of it has been a pretty closely guarded secret. Laura Weber Cash: We initially held off advertising we had bought it for many reasons. First, we went through the 'we're not worthy' stage. It took a while for us to come to the conclusion that it was OK, as long as we shared it. As soon as it made its way to Tennessee, we had it reframed, floated, on an acid-free matte with museum glass in a beautiful handcrafted Italian dark wooden frame. We wanted to present it properly. We felt strongly that we needed to find a place for it so that others could enjoy it as much as we have. When we were contacted by the Bluegrass Museum in Owensboro, we were relieved to have a direction. They asked us to consider a loan to coincide with their two-year exhibit on Bill Monroe, beginning in September, and we happily obliged. Mandolin Cafe: The Country Music Hall of Fame has a "Precious Jewels" collection made up of Monroe's mandolin and the guitars of Johnny Cash and Mother Maybelle Carter, some of the most famous acoustic instruments in country music history. Did you make that connection in the process of acquiring it? Laura Weber Cash: No, actually, we really didn't know what we would do with it, but we knew there would be plenty of options. I didn't occur to me the CMHOF may be interested in obtaining this as part of that "Precious Jewels" collection. Those are key instruments that built the roots and sounds of country music. This headplate, now a piece of memorabilia, didn't seem a fit. 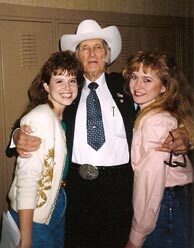 L-R: Jonita Aadland, Bill Monroe and Laura backstage at the Grand Ole Opry in the early 90s. Click to enlarge. Editor's note: according to Mick Buck, curator for the CMHoF, the museum did not have an acquisition fund for this kind of property at the time of its sale and did not have an interest in acquiring the headplate. This quote appears in an interview we did with Mick in February, 2010. Mandolin Cafe: What is known about the connection between Bill Monroe, Johnny Cash and June Carter? They surely had many opportunities to meet over the years. Laura Weber Cash: You know, there's really not much of a personal connection there that I'm aware of. Of course John Carter's family knew Bill. John and June would invite him to occasional pickin' parties at their home in Hendersonville. John had a great respect for Bill's music since his youth. I do recall that Bill was inducted into the Country Music Hall of Fame the same day as the Original Carter Family, in 1970, and Johnny dedicated a 4 or 5 song tribute to him on the Johnny Cash Show with help from John Hartford, Vassar Clements, and Norman Blake, among others in 1969. Mandolin Cafe: Have you had a chance to review any of the artifacts that will be on display as part of the exhibit with the headplate? Laura Weber Cash: I understand The Bill Monroe Exhibit opens on September 10, just three days before what would have been Bill's 99th birthday at the museum at 6:00 p.m. I heard Uncle Pen's fiddle will be displayed, as well as some of Bill's clothing, records, and other personal artifacts. Mandolin Cafe: The headplate will have a life beyond us all. Have you had time to think of your desire for this icon of American music say 75 years down the road and what kind of role you might want it playing in music history? Laura Weber Cash: No, we hadn't really made long term plans for it. We know that many, many people hold this precious item close to their hearts. We expect that fate will play a part in its future and will also share a large part in where it may end up. We will do our best to see that its transfer from our hands is to the right place, at the right time. That certainly is a good story of custodianship for a venerated piece of the Blue Grass Music. Good article; neat photo! "... and others." Would that be Ricky Skaggs a bit past Bill's left shoulder? I'm so glad that this interview happened. Many folks have wondered what happened to that Iconic headstock overlay... I'd also like to know what happened to that headstock overlay to get to where it is now... Did Charlie have it in his shop, or? Thanks for going after this story Scott.. I'd like to say thanks to Laura and John for preserving this piece of music history. Ken, it wasn't Charlie that had it. I've seen the name of that individual and can probably dig it up later today. The gentleman that sold it was known to have been the person that performed the repair on it while at Gibson. Also, I'd like to publicly thank Ken for his help in setting up this interview. I found out independently who the owner was shortly after it sold and just by chance in a discussion with Ken learned that he knew who the owner was and happened to be personal friends with Laura. Ken really made this interview possible and it has been in the works for around two months now. Also like to say that Laura was a totally classy lady to work with doing this interview. And, if you haven't had a chance to hear some of her fiddle work, you owe it to yourself. She has major league chops and taste. Great stuff. Laura is one of the nicest people I've ever met and a great fiddler. I'm impressed that she won a national fiddle contest in the junior section and then went back twenty years later and won again as an adult. You have to have the goods to do that. mandomedic - there was a heap of discussion when this was coming up for auction, and you can read about it here: http://www.mandolincafe.com/forum/showthread.php?57104 I believe someone posted a link to an article about how it was saved from the scrap heap. I'd tell you who those folks are but in just re-reading the article, I think it's worth your time if you're interested to just read that entire story once more. I agree. That was part of why I mentioned the thread - along with our usual jibber-jabber, there was some interesting related information (plus that link, natch). Always more to learn from than bullet points. Serious bit of Mojo there. And after two years, where will the headstock veneer go? So how does that square with the audio recording of Monroe in his own voice (at the outset of this article) explaining about being upset at the amount of time Gibson had the mandolin in their possession? Having heard versions of the headstock defacing since the sixties, I remembered, upon reading this interview, a detail that I have not heard discussed: Mr. Monroe, I was told, placed a 99 cent price tag right over the Flower Pot inlay to further denigrate the brand. It was said to be a Rexall Drug Store tag. See MCA Records "Bluegrass Instrumentals" and "Blue Grass Style" cover photos, the tag is clearly visible. Anyone else know a version of this tale? This is one of those interesting pieces that tends to be forgotten. On this anniversary of its publication three years ago thought worth bringing to the top for a bit of fresh air. Haven't followed up to see where the head plate is these days, if its visit to the Owensboro Museum was extended or if it is back with the owners. The gentleman on the far right in the jam session photo is the late George Chestnut. He was an extraordinary bass and fiddle luthier and close friend of Bill Monroe. Noting the anniversary of this feature article published this date 2010.